You need a little homework when comparing the best options of materials for building your deck. The success in choosing the best material will impact on the outcome of your project. You may need to decide between Composite and Vinyl Deck materials and the choice you make depends on your understanding of the two materials. While we suggest discussing the issue of selecting the best material with a professional deck builder, it won’t hurt if you know a little about the materials. Although there are different types of materials for building your deck, Composite and Vinyl deck materials are two options you will often need to decide between. What is composite deck material? Composite deck materials are one of the most used products in the industry. It is made out of wood and plastic particles, carefully strengthened to provide rugged and long-lasting material combining the qualities of both wood and plastic. It exists in two main types known as capped and uncapped. The process of making the composite materials is what stands each one apart. What is vinyl deck material? Vinyl is a synthetic decking material that brings so many advantages to the decking world. 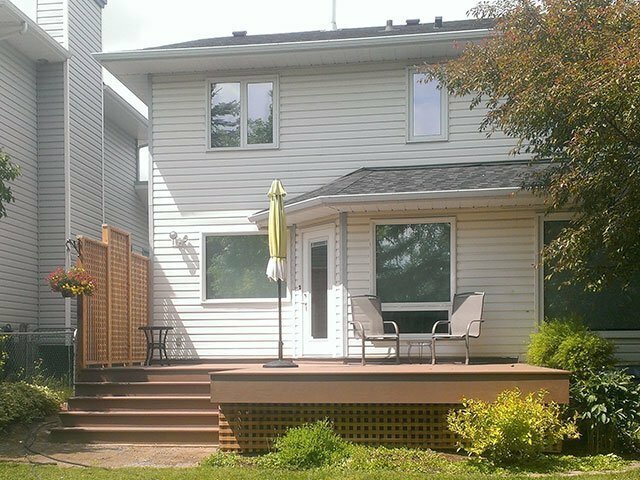 Vinyl is a weather resistant, low maintenance option to decking construction using specially made plastic materials designed for quality deck projects. If you are left to choose between two related decking materials such as composite deck material or vinyl decking material, this article is tailored to give you the best decking option for you. The most reasonable approach to selecting the best material is from a benefits perspective. You will also need to consider the element of costs, longevity and the type of deck you are installing. To help you decide, the following comparison between Composite material and Vinyl materials. Strength. Composite is a product of wood and plastic particles industrially compressed using relevant technologies to produce the material. Being a derivative of another material, it is lower in strength than its vinyl counterpart; composite decking material may sag when exposed to weather. Performance. Composite decking material does contract and expands according to weather. As a result of the expansion and contraction, composite decking may crack or split along the edges. Vinyl decking, on the other hand, maintains optimum performance throughout. Durability. Composite decking may flake with time which causes it to deteriorate with time. Vinyl decking keeps its quality without showing sign of surface deterioration. Cost. Composite decking is cheaper and affordable than the vinyl decking material. The differences in price also define the reason to choose either of composite and vinyl for your decking material. If cost is important to you, going for composite decking may be the right option, and if quality and longevity is a priority, vinyl decking material will be considered. 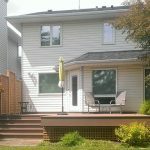 It is best to work with expert deck builder when deciding between composite deck and vinyl deck materials. The expert understands the most critical factors to consider when choosing between the two materials. 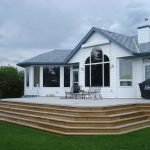 Contact Mountain View Sun Decks for all your decking needs.